Hello, everyone! Let me first introduce myself. My name is Spirited Wolf and I love to share my knowledge with everyone and anyone who needs it. You can contact me on Cybrary or on my Facebook. Now, let’s get started. 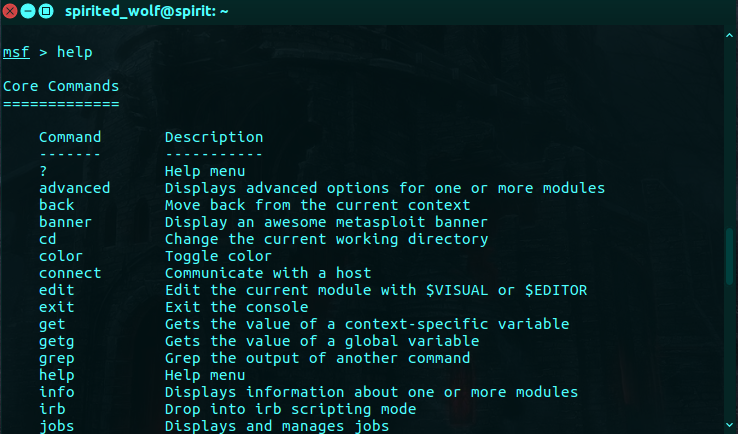 There are several interfaces for Metasploit available. The most popular are maintained by Rapid7 and Strategic Cyber LLC. The free version. It contains a command line interface, third-party import, manual exploitation and manual brute forcing. In October 2011, Rapid7 released Metasploit Community Edition, a free, web-based user interface for Metasploit. Metasploit Community is based on the commercial functionality of the paid-for editions with a reduced set of features, including network discovery, module browsing, and manual exploitation. 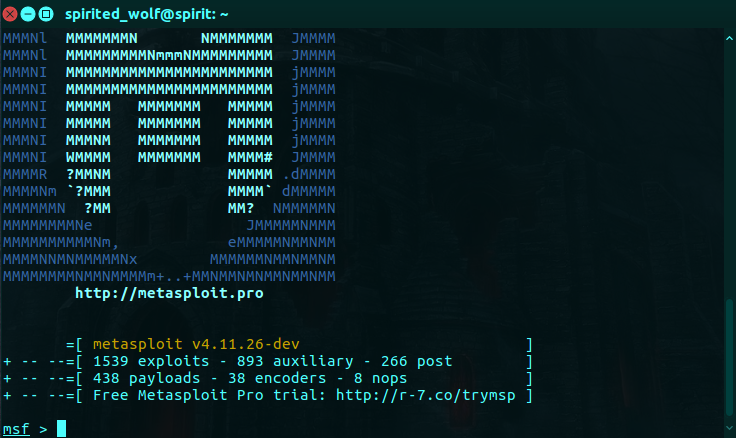 Metasploit Community is included in the main installer. In April 2010, Rapid7 released Metasploit Express, an open-core commercial edition for security teams who need to verify vulnerabilities. It offers a graphical user interface, integrates nmap for discovery, and adds smart brute forcing, as well as automated evidence collection. In October 2010, Rapid7 added Metasploit Pro, an open-core commercial Metasploit edition for penetration testers. Metasploit Pro adds onto Metasploit Express with features such as Quick Start Wizards/MetaModules, building and managing social engineering campaigns, web application testing, an advanced Pro Console, dynamic payloads for anti-virus evasion, integration with Nexpose for ad-hoc vulnerability scans, and VPN pivoting. Armitage is a graphical cyber attack management tool for the Metasploit Project that visualizes targets and recommends exploits. It is a free and open source network security tool notable for its contributions to red team collaboration allowing for shared sessions, data, and communication through a single Metasploit instance. Cobalt Strike is a collection of threat emulation tools provided by Strategic Cyber LLC to work with the Metasploit Framework. Cobalt Strike includes all features of Armitage and adds post-exploitation tools in addition to report generation features. First of all, let’s start the Metasploit service. ->Msfconsole is the main interface to Metasploit. There are GUI interfaces (Armitage), and a web interface too (websploit). With msfconsole, you can launch exploits, create listeners, configure payloads etc. If you want to check what commands you can use, then just type “help” or “?” <- question mark without the quotations. See you in my next tutorial, and if you want to check some of my other Metasploit tutorials then you can request more info in the comments, and/or check them on my channel. Thanks for this tutorial1. Appreciate.